Calling it the "largest, most ambitious affordable housing plan ever" from any U.S. city, Mayor Bill de Blasio announced his vision to build 80,000 new units of affordable housing over the next 10 years while preserving another 120,000. "The crisis is greater than ever before," the mayor said at a press conference in Brooklyn on Monday, adding later in the Bronx that housing costs have "undermined the very idea that people can live in New York long-term, that people can stay in their own neighborhoods." De Blasio's plan would build more than four times as many apartments for very low-income people than Mayor Bloomberg's programs did. Yet the plan is likely to fall far short of solving that crisis. In documenting the depth of the problem, the plan notes that the city has about 980,000 households who earn less than $42,000 a year (50% of metropolitan “area median income”) for a family of four—including more than half of its renters—and about 360,000 of them spend more than half their income on rent. It says there are about 425,000 apartments that rent for $1,050 or less (about 40% in public housing), what these households could afford without spending more than 30% of their income on rent. That’s a shortfall of more than 550,000 units. In short, the de Blasio plan would build about 16,000 apartments for this income group—more than twice as many as Bloomberg did, but not quite 3 percent of what it implies are needed. The plan's 80,000 new apartments will be built using city funds to leverage private development. In areas rezoned to allow taller, denser buildings, developers would be required to include 50 percent "middle income" apartments—more accurately, for the upper middle class, designated for households with incomes of roughly $100,000 to $140,000, and renting for $2,500 to $3,500. Another 30 percent would be for "moderate income" households, who make $67,000 to $100,000; these would rent for about $1,700 to $2,500. The remaining 20 percent would be for "very low income" households, those making less than $42,000. This would replace the city's 80/20 formula, in which luxury housing developers could get tax or zoning breaks if they agreed to include up to 20 percent below-market units. The plan is "the outer limit of what can be achieved in a decade," the mayor said. The administration estimates its cost at $41 billion, including $8.2 billion in direct city investment. But it is limited by three major constraints. First, although there are almost 250,000 people on the waiting list for the city's public housing, public housing construction is "essentially frozen" due to a lack of funds, de Blasio said. Second, while the plan calls for preserving 120,000 currently affordable apartments, state law lets landlords deregulate vacant rent-regulated apartments if the rent can be raised to $2,500 or more, and the market is inexorably pushing rents toward that threshold all around the city. More than 250,000 apartments have been decontrolled since the first version of that law was enacted in 1993. "We have lost more units through deregulation than this ambitious plan calls for producing," says Larry Wood of the West Side SRO Law Project. "If we keep losing affordable rent-regulated units through vacancy decontrol, all the new production will be meaningless." Third, while the plan calls for repealing the state law that prohibits the city from strengthening its rent laws, it does not urge the repeal of vacancy decontrol. "We will work with the state as rent regulation comes up for renewal in 2015 to prevent abuses of the vacancy and luxury decontrol provisions," the report says. That wording enrages veteran tenant activist Michael McKee, who calls it a carefully phrased "cop-out," reneging on de Blasio's campaign promise to support repeal. Instead, the plan's preservation initiatives will rely on intensified enforcement against housing-code violations and landlords who harass tenants. The mayor called 1269 College Ave, the Bronx building where he held the press conference, "a prime example" of such preservation. As public advocate in 2012, he named the building's then-owner, Eli Abbott' s College Management, the worst landlord in the city. Tenants there complained about rats breaking into their refrigerators and ceiling leaks so bad they had to sit on the toilet with an umbrella, while rents averaged more than $1,100. The building was rescued, explains longtime Bronx community organizer Harry DeRienzo, by a complex network of tenants, community groups, city agencies, legal services, a sympathetic bank, and a new landlord ethical enough to renovate the building while keeping rents down. Apartments there now cost $650 to $1,100, he adds—cheap by Manhattan standards, but not so cheap for Bronx residents. Finally, the plan's new housing relies on private developers, which means rents can't be so low that it discourages them from participating. "To pay market rate for a site and create 50 percent affordability is clearly not feasible," developer David Pickett said at the Brooklyn press conference. The administration did not propose building nonprofit co-op developments like Electchester in Queens or Manhattan's Penn South, says Deputy Mayor Alicia Glen, because it's too hard to find large enough plots of land. The result is that large groups of people will be left out the plan. It does not specify how many apartments will be built for the city's working poor, but the $40,000 a year it categorizes as "very low income" is middle-class next to a minimum-wage worker, for whom even a $600 rent would take more than half their income. The administration expects that the bulk of its preservation efforts will benefit the city's middle class, households making roughly $42,000 to $67,000, but no new housing is slated for this group. Several housing activists praised the "different tone" of the de Blasio administration. After 12 years of Bloomberg, who thought astronomical rents demonstrated the city's success as a luxury brand, it's good, they say, to have a mayor who cares about people being able to afford to stay here. On the other hand, to solve the crisis, de Blasio has to deliver more than Clintonesque "I feel your pain" bromides about inequality. To make a significant dent in its housing shortage, the city really needs something on the scale of the Mitchell-Lama program, which from 1955 to the late 1970s built more than 100,000 apartments that were genuinely affordable to working and middle class people. As of now, it appears that his administration's plan may replicate the worst flaw of Bloomberg's housing programs: In the name of "affordable housing," building more apartments that cost more than $2,500 than ones that rent for less than $1,000. The next time a New York City developer seeks permission to replace a derelict factory with a shimmering condo tower, the heated swimming pool and sky-lit roof lounge will have to be accompanied by another amenity: affordable housing. In the most forceful remarks yet of an administration determined to reshape the cityscape, Mayor Bill de Blasio’s top planning official declared on Friday that affordable units will be a requirement for any future real estate project requiring a zoning change from the city. The mandate will apply not only to neighborhood-wide redevelopments, like the earlier transformation of industrial Williamsburg into a residential mecca, but also to individual projects, as when a developer needs a waiver to graft stories onto an apartment tower in Midtown. Aides to Mr. de Blasio, who has pledged to create or preserve 200,000 affordable units in the next decade, have signaled for months that mandates for developers were on the way. But Mr. Weisbrod’s comments provided the clearest glimpse yet of what the city’s plan would mean in practice for the real estate industry, which is still wary of a mayor who has presented a lofty vision for future development but has provided few details on how he plans to achieve it. New York City underwent immense change during the Bloomberg years, when thickets of new condos cropped up across Brooklyn and Queens. Few developers, however, opted to include affordable units, despite tax incentives and other subsidies dangled by the last administration. A report last year estimated that of 21,000 new housing units built as an outgrowth of major city zoning changes since 2005, only about 13 percent of the units, about 2,700, were affordable housing. Opting out is now off the table, Mr. Weisbrod said on Friday. Still, much of the city’s housing plan, which calls for the building of 80,000 affordable units and the preservation of 120,000, remains shrouded. Mr. Weisbrod said an initial plan would be revealed by year’s end. The mandate would take effect by the fall of 2015, though the rules could be held up by a series of public reviews. In the interim, private projects would still be subject to the same new standards, which will prevent developers from rushing construction to avoid including affordable units. Astoria Cove, a 1,700-unit project along the East River in Queens, is the first such project under review to opt into the zoning program at the behest of the administration. Mr. de Blasio’s team declined to say which neighborhoods they were examining as potential sites for large-scale redevelopment, except East New York, Brooklyn, which was announced in May. These communities could gain hundreds or thousands of units of affordable homes. 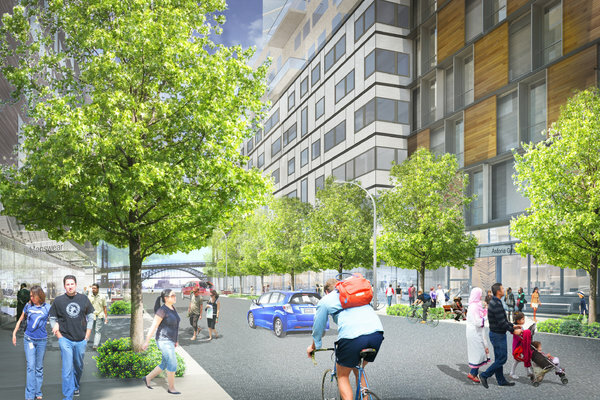 Astoria Cove in Queens, in a rendering, has opted in to the new rules. But an official involved in internal discussions said that among the areas that planners are considering for zoning changes were East Harlem around Park Avenue, a stretch of Inwood along the Harlem River, both in Manhattan, and the eastern section of Long Island City in Queens. The changes would allow for higher density of residential buildings. The official requested anonymity to describe private conversations that have been zealously guarded by the administration, which does not want to publicize the sites before it can hold discussions with residents in each neighborhood. While some developers are wary of Mr. de Blasio’s new rules, many liberal housing advocates believe he is not going far enough. They say the administration should demand that a higher proportion of units in new developments be reserved for low- and middle-income residents. The administration is eager to dispel those doubts, and Mr. Weisbrod’s comments on Friday were greeted warmly by advocates. “They’re definitely going in the right direction,” said Jaron Benjamin, director of the Metropolitan Council on Housing, who has called for at least 50 percent of units in new buildings to be affordable. The Bloomberg administration set the affordability standard of 20 percent of units; the new mayor has vowed to aim higher but has not said how high. Privately, some developers expressed skepticism about the administration’s plan, fearing that the requirements would make it financially difficult to build. While few in real estate criticize the mayor publicly, Mr. Weisbrod acknowledged those concerns, saying the industry was a necessary partner. In his speech, Mr. Weisbrod said the administration would take steps to ease the bureaucratic burden on developers, such as speeding up the public review process and rolling back other onerous regulations. And he pledged that planning officials would consider new projects on the merits when determining how many affordable units should be included. “What we think we require in a superhot neighborhood in Manhattan is going to be a lot different from what we think we can require, or should require, in an emerging area,” Mr. Weisbrod said. What is the solution to affordable housing in New York? One number has been repeated over and over — 200,000 subsidized units, to be built or preserved over a decade. Mayor Bill de Blasio promised it, but has yet to explain how he’ll get there. Here are two other numbers: 9 x 18. In square feet, that’s 162, smaller than the most micro micro-apartment. It is the size of a typical parking space. That lowly slice of asphalt has prompted three young architects — Miriam Peterson, Sagi Golan and Nathan Rich, fellows at the Institute for Public Architecture — to come up with what could be an innovative way to ease the housing crisis. I’m intrigued by their proposal, “9 x 18,” because it’s about more than apartment buildings plopped onto vacant land. It considers how parking spaces — mandated in outmoded zoning regulations, prolific at public housing sites — might be leveraged into something more ambitious, something that encourages a mix of housing in active neighborhoods with accessible transit, public services and lively streets. In effect, the proposal trades asphalt for housing and amenities. BEFORE Current parking at a superblock-size East Harlem housing development. And even if “9 x 18” isn’t perfect or foolproof — especially when it comes to finances — at least it is concerned with more than hitting some arbitrary number. After all, the New York City Housing Authority, albeit with a wealth of federal money, did build nearly 200,000 subsidized apartments in the two decades after World War II. But that was hardly an unqualified success: Too many of those apartments ended up in projects on the far edges of the city, without shops or grocery stores, surrounded by vast parking lots that acted like moats, thwarting street life and cutting off residents from the rest of the neighborhood. Many of the projects are crumbling today. The housing authority is broke. The “9 x 18” proposal capitalizes on an outdated and onerous zoning mandate that requires private developers to build parking spaces for new apartments in certain parts of the city. The regulation clashes with Vision Zero, the mayor’s new pedestrian safety initiative. It’s also bad for traffic and the environment. And it forces developers to spend what a study by the Furman Center at New York University estimates is up to $50,000 per parking space, money inevitably charged to consumers, increasing housing costs. The mandate should be abolished, but dropping it would clearly force city officials to collide with car-owning voters, especially those poorly served by mass transit. Instead, the “9 x 18” plan turns the zoning requirement into a kind of commodity. It calls for a new regulation that would tie the number of required parking spaces to the number and size of apartments, their affordability and proximity to mass transit. That last part — which promotes density and discourages cars around transit hubs — is critical. It’s a policy the city should have adopted long ago. AFTER The same site could include a parking garage and multiuse development. The plan would also give developers the option of paying into a fund to reduce their parking requirement further. The fund would go toward constructing mixed-use parking structures on housing authority lots: covered garages with shops and services at street level, play areas for children at the top, which consolidates parking for the neighborhood and frees up space on authority lots for more development. That might include day care and senior centers, supermarkets, libraries and offices topped by mixed-income housing. The services and amenities would cater to housing authority tenants and attract people from the surrounding community, knitting them together. We are talking about citywide reform. If you add up all the street-level parking spaces on housing authority lots around town, you get more than 20.3 million square feet, well over half the size of Central Park. Mayors, of course, have known for ages about this public property gold mine. When the Bloomberg administration belatedly proposed letting private developers build market-rate towers on some of this public land to raise money for the housing authority, residents went ballistic. That was no surprise; taking public property from poor tenants and handing it to private developers sounded like just another sop to the rich. Officials barely consulted residents. The approach was top down and half-baked. By contrast, “9 x 18” would embrace housing authority tenants, who would negotiate with officials regarding where and how their building and grounds might be changed and improved. 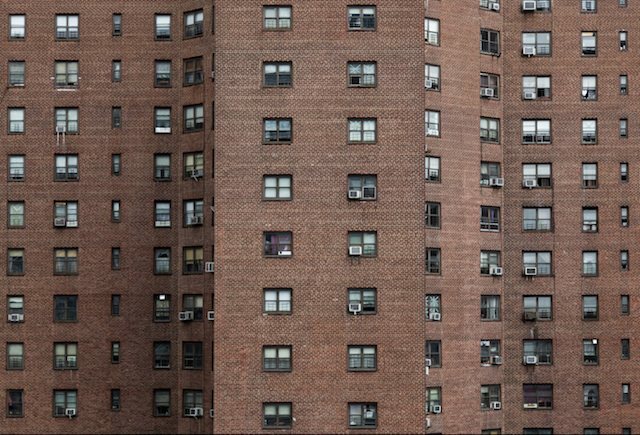 More than 400,000 New Yorkers live in the authority’s 334 public housing projects, and meaningful improvements to subsidized housing across the city needs to take their welfare into account. The “9 x 18” scheme is not altogether new. Several years ago, the city’s Planning Department reduced the parking requirement at the Linden and Boulevard Houses in Brooklyn, which freed up room for senior housing. Many of the new residents had lived in large apartments in those projects, so those apartments went to new families, creating a nice domino effect. Other similar efforts are in the works. 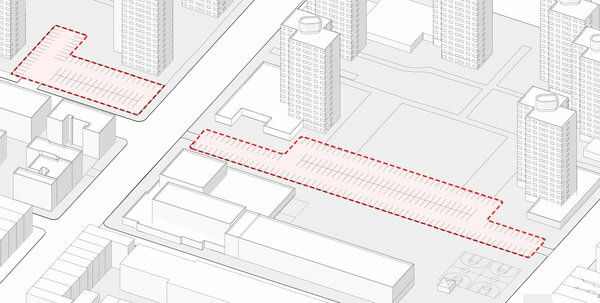 Parking spaces have similar dimensions to the standard unit sizes of affordable housing in New York City. But “9 x 18” faces steep financial challenges. Profit margins for subsidized housing are notoriously slender. Developers theoretically could make money from the shops and market-rate apartments, and they would pay less into the parking garage fund than the parking mandate now costs them. That said, it’s one thing to propose adding retail and some market-rate apartments on a lot in Manhattan, another in less affluent boroughs. And will leases for new developments really throw off enough cash to repair the housing authority’s boilers, roofs and windows? Aside from getting these numbers to balance out, the other hurdle to realizing the architects’ plan is ensuring housing authority tenants get a fair shake. The goals are right, though: Prod developers to spend money not on parking but on subsidized housing and neighborhood improvements; promote equitable and diverse development in areas that could and should be denser; and involve the residents of subsidized projects. Of course, many public housing projects don’t need to be filled in, they need repairs. And more than a few residents may want open space and their current parking spots. In the “9 x 18” proposal, some residents would lose one or both. They might be compensated in novel ways. Mr. Golan noted that tenants who, say, run small businesses out of their homes might bargain for offices in the new multiuse developments. “This needs to be a collaborative approach,” he stressed. That suits the mayor’s agenda. His administration wants to think big and work from the ground up, housing-wise. Time is wasting. By one estimate, the city has a net loss of 38,000 subsidized apartments every year, so even 200,000 in a decade would barely stem the decline. The “9 x 18” plan is rough, but a start. City officials want to give an affordable housing firm a 99-year lease so it can build low-income housing for seniors on the Upper East Side. The Health and Hospitals Corp. is floating the proposal, which would grant SKA Marin the rights to redevelop Draper Hall, a former dorm for nurses on First Ave. near 90th St., and expand the 114,463-square-foot building by 13 floors, the Commercial Observer reported. The project, which calls for 202-units, mostly one-bedrooms would be completed by the end of 2016, and the developer would lease the site for $100,000 per year. City Council must first approve the plan, which would be funded by the Department of Housing Preservation and Development. Council speaker Melissa Mark-Viverito is currently reviewing the proposal. Thought there'd be plenty of crappy low-rise buildings to chose from instead of targeting community gardens...and the community itself . This garden on Willoughby Avenue could be razed for affordable housing. Screenshot via Google Streetview. The local gardener versus big developer is a common David-and-Goliath situation in New York City, and now, for more than a dozen community gardens, the city is Goliath, in an effort to build more affordable housing. This week, the Department of Housing Preservation and Development released a list of nearly 180 city-owned development sites, asking developers to submit proposals for small condo (up to 14 homes) and rental (up to 30 apartments) projects. By DNAinfo's count, at least 15 of the sites are currently used as community gardens. But there could be more; of the HPD's 1,000 vacant lots, 74 of them hold gardens, according to the nonprofit 596 Acres. DNAinfo talked to a few gardeners who were shocked and saddened by the news, but they knew that this could happen. When a community garden opens on city-owned land, they sign a letter of understanding stating that the use is temporary and that they won't try to stop any development plans. HPD spokesman Eric Bederman told DNAinfo, "While community gardens add a great value to our city, our mission as an agency is to address the affordable housing crisis that affects tens of thousands of hardworking New York families." Still, some argue that razing gardens could be easily avoided, given the city's large inventory of vacant sites. Jackie Robinson Community Garden at Park Avenue and East 122nd Street, which has existed for more than two decades. Electric Ladybug Garden at 239 West 111th Street. The city has already padlocked this space. Evergreen Lots at 120 Jefferson Street in Bushwick. 596 Acres helped create this garden. Nine months after Bill de Blasio announced his ambitious plan to create or save 200,000 units of affordable housing over the course of 10 years, the mayor plans to make that the primary focus of his second State of the City speech today, according to a video released by his office (above) and an article in the New York Times. Among the new strategies that de Blasio is expected to announce are a rezoning of East Harlem and Stapleton, Staten Island that would allow for taller residential buildings and would require affordable housing, and a $36 million program to provide legal services to tenants in newly rezoned neighborhoods to protect them against harassment from landlords. The mayor will also announce plans to build 160,000 new units of market-rate housing to correct "a serious supply-and-demand imbalance" per deputy mayor for housing and economic development Alicia Glen. NY YIMBY points out that this would be far more units than were constructed under the aggressively pro-development Bloomberg. "We want to explain the benefits of density, and why density is not, per se, a scary thing," said Glen. 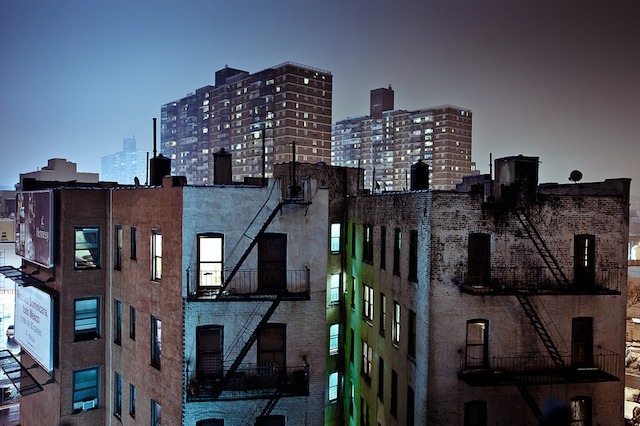 New York City’s biggest housing program is a tax exemption known as 421-a. Under this program, most of the property tax on newly constructed apartment buildings is waived for periods of 10 to 25 years. Each year, this program costs the city more than $1 billion in lost revenue — far more than the entire budget of the Department of Housing Preservation and Development, which enforces the housing code, supports the development of new housing and distributes 33,000 federal Section 8 vouchers. The billion dollars lost because of 421-a would be enough to fund 100,000 new rent vouchers similar to Section 8, and thus provide housing to many of the city’s poorest people. Instead, the money is spread over 160,000 apartments, of which probably well under 10% are “affordable” — meaning, the latter typically have rents limited to fit the budgets of households with incomes around $45,000 for a family of three. So instead of helping 100,000 of the poorest households, the money goes to fewer than 16,000, who are living a little below the city’s median income. This program is so preposterously inefficient that only politics provide an explanation for it. Back in 1971, when the law was written , private residential construction in the city had collapsed — and legislators thought, perhaps reasonably, that a broad tax subsidy was needed to counter investors’ wariness about the city’s prospects. By the 1980s, that justification for the program was starting to seem weak, and the huge flow of benefits to the city’s powerful real estate industry seemed in peril. But legislators found a way to keep the program alive by adding affordability requirements and thus giving it a new justification. Initially, those requirements applied only to part of Manhattan, but in 2006 and 2007, the area subject to them was expanded, and other modest reforms were made. In a 2011 twist, lawmakers mysteriously chose to exempt five properties from the new rules — including One57, the superluxury tower where an apartment recently sold for $100 million. These changes did not really change the essence of 421-a. Although the law technically became known as an affordable housing program, it retained the structure of a construction stimulus. In much of the city, developers receive the subsidy “as of right,” which means that they get it without having to apply and be approved. For the rest of the city, developers must include affordable units — but those who do also receive benefits without any application and approval process. The lack of such a process means that there is no mechanism to match the cost to taxpayers to the housing benefit created. Now 421-a is due to expire on June 15, and again there is talk of tinkering with the affordability requirements. Once again, the city’s powerful real estate industry will try to keep the program alive with minimal reforms. The de Blasio administration reportedly wants to require all who accept the abatement to build some affordable apartments — and to increase the percentage of affordable units required in Manhattan and adjacent parts of Brooklyn and Queens (now at 20%). Others call for slightly different reforms. But even if these ideas make it through the legislative sausage-making process, they will increase the program’s efficiency only modestly. They won’t change the fundamental mismatch between a broad, no-questions-asked exemption and the goal of producing much more housing New Yorkers can afford. It would be much better to rip 421-a up and start over. One solution would be creating a tax credit that developers must apply for, just as they now apply for the federal Low Income Housing Tax Credit. The city would decide how much credit to offer each year, establish standards for determining the best use of the credits and award them to the development projects judged best according to those standards. This way, the city would lose less revenue — and increase the amount of tax subsidy that actually promotes affordability. "this program costs the city more than $1 billion in lost revenue"
Serious question: Does NYC really need 160,000 more market-rate apartments? The East New York neighborhood in Brooklyn. The New York of the 1950s and early ’60s, for all its grime and problems, was far more hospitable than today’s city to working-class and middle-class families, full of stable and affordable neighborhoods where they could live and strive. That disappearing New York seemed to lie at the core of Mayor Bill de Blasio’s State of the City speech on Tuesday. He said reclaiming it through affordable housing would be his main mission for 2015, the start of an all-out effort and a building boom on a scale unseen in generations. It is a timely and exciting mission. Too-slow growth and gentrification have shrunk the supply of affordable housing while greatly increasing New Yorkers’ anxiety about what their city is becoming. Mr. de Blasio’s answer is this: Build aggressively and densely, and demand that a significant portion of new units be permanently affordable. Use all means possible to protect what’s there, including strengthening rent regulations and tripling, to $36 million a year, the amount the city spends to protect tenants from greedy landlords in housing court. The skeptics hit back almost instantly. Gov. Andrew Cuomo’s office pronounced one of the mayor’s ideas — a plan to create 200 buildable acres from thin air on a deck over the Sunnyside rail yards in Queens — dead on arrival. And residents in some neighborhoods where Mr. de Blasio hopes to build, worried that they were doomed to be overwhelmed by a tide of soaring rents and evictions, asked the million-dollar affordable-housing question: affordable for whom? The success of the plan, laid out by the administration in a 116-page book of policy prescriptions, will depend on several factors. One is toughness: mandatory inclusionary zoning, stronger rent laws, an army of Legal Aid lawyers, stricter code enforcement against landlords who let properties decay. Another is persuasion. Mr. de Blasio will have to convince New Yorkers that the huge construction binge he wants — including 160,000 new market-rate units plus 80,000 affordable ones — and years of noise and inconvenience will be for their benefit. And this, in turn, involves making the difficult argument that even though only a fraction of the new units will be affordable — 20 percent or 30 percent or more, depending — this will be enough to build a city within the city that is within a regular New Yorker’s financial reach. Mr. de Blasio’s skeptics are right about some real estate truisms; the people with lots of money are poised to win no matter what — they will get their water views and dog salons — and developers will profit mightily. 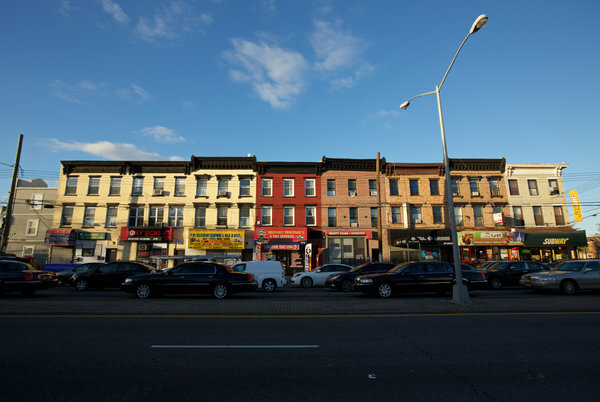 And in parts of the city on the churning edge of the gentrification wave, as in stretches of Franklin Avenue in Crown Heights, where storefront Pentecostal churches and old brownstones mix with banh mi places and ironic coffee shops, displacement seems inevitable. That is one reason the mayor has been talking openly about gentrification and promising to help batten down neighborhoods’ affordability before the wave hits. It is also why his administration has been dispatching officials to community meetings across the city where neighbors have been up in arms — for good reason. Brooklyn’s Barclays Center project gave developers and corporate tenants the tax breaks and profits they wanted, but the gauzy promise of an affordable neighborhood around it has not yet been fulfilled. In Manhattan, giant luxury towers still sprout skyward, while rich foreigners park their money in luxe apartments that stay empty. By taking on affordable housing, Mr. de Blasio is making a full, multiyear commitment to a mission that, like “cleaning up Albany,” sounds vague and impossible. But Mr. de Blasio seems to mean it. Cynicism is easy. Idealism is hard when you’re a politician who is making a huge promise, is expected to deliver and could lose his job if he fails. For the salvation of New York as a diverse, mixed-income city that is there for everybody, it’s essential that Mr. de Blasio gets this right. He needs to get hammering, starting now. What, all the luxury residential that only the very few can afford? And all those poor developers who wouldn't be able to stay in business without 421-a? Seriously?! A decades-old tax program has become a flashpoint in the New York City housing debate. Some of New York's most exclusive new addresses have benefited from tax breaks under 421-a. The renewal of an arcane piece of housing policy with an esoteric name like 421-a seems like something that should fly pretty safely under the radar. But in New York City tenant advocates have taken to the streets to protest a 44-year-old property tax exemption program that they say is being used to subsidize luxury apartments for millionaires and billionaires. With the program up for renewal in the New York State Legislature this June, these advocates, along with some City Council members, are urging Mayor Bill de Blasio to push for its elimination. But developers are advocating for just the opposite, saying that 421-a is needed to keep the city building. The 421-a tax exemption program was launched in 1971 to boost multi-family housing development in New York City by offering property tax abatements that could last up to 25 years. The program was subsequently tweaked to require developers building in highly desirable areas to set aside a certain amount of affordable units. In 2008, the program was updated again requiring that affordable housing in these high-demand areas was on-site. But as tenant advocates point out, these units are not required to be permanently affordable. One57, a luxury residential tower designed by Christian de Portzamparc. Over the decades since 421-a went into effect, a lot has changed in the New York City real estate world and those opposed to the program say it is no longer necessary to incentivize development in this way. They see 421-a as an unnecessary tax break for the wealthy that is cutting off funds for the city. According to the Independent Budget Office, in 2013 alone 421-a tax exemptions cost New York City $1.1 billion in lost tax revenue. Adding to the overall controversy is the fact that many units receiving these huge tax breaks are in some of New York’s most expensive buildings. This includes the Christian de Portzamparc–designed One57, which has become a reluctant poster child for the program. New York City developers contend that residents in 421-a buildings will ultimately pay their fair share of taxes, and that the program is absolutely essential to achieving the mayor’s housing agenda. “Without this critical tax incentive, the city would see a sharp drop off in the production of new housing units, a further skewing of the residential market toward condominium rather than rental production, and an accelerated tightening of housing costs for renters and buyers alike,” said Steven Spinola, president of the Real Estate Board of New York, in a statement. Maier said the idea that developers still need these subsidies is both “absurd” and “offensive” given the profits they are now able to earn from New York City real estate. Like many housing activists, Maier wants to see 421-a, “a horrible policy,” die out this June. Even if that does not happen, she is optimistic that Mayor de Blasio will champion reforms to the program that benefit lower-income New Yorkers. This could include expanding the area where developers must include on-site affordable housing and requiring new affordable units to permanently remain below market-rate. Tenant leader Lisa Kenner shows where developers want to build apartments at NYCHA's Van Dyke Houses in Brooklyn. Most of these parcels are related to 12 projects where NYCHA has sold vacant or what it deems “underutilized” land to developers to build affordable or senior housing. On some parcels, the housing is now up; on others it’s in the works. Recently, tenants say, NYCHA officials have visited their developments in search of more potential land to sell, with plans for more “For Sale” signs later this year. Agency officials wouldn’t discuss details, promising to lay out their plans in May when Chairwoman Shola Olatoye unveils her “Next Generation NYCHA” plan. But at a City Council hearing last week, Olatoye made note of plans to “harness NYCHA’s real estate assets” to solve the authority’s mounting budget problems. Some tenants are angry that the limited open space they enjoy will soon be displaced by towers of apartments. Others are ecstatic, hoping much-needed senior housing will rise on what they see as wasted space. A quick look at the math makes clear why this is happening: NYCHA faces a $98 million budget gap this year that could expand to $400 million by 2025, and it’s got a waiting list of 250,000 people desperate for affordable housing. In a statement to The News Friday, Olatoye made clear any land sale effort would be designed to remedy NYCHA’s fiscal ailments. Encouraging NYCHA to use every bit of land it owns, a major coalition of tenant and church groups, Metro Industrial Areas Foundation, recently identified 17 vacant NYCHA parcels in the Bronx and Brooklyn where they hope developers will put up senior housing. “The mayor ought to use NYCHA’s underutilized parking lots to immediately build 15,000 units of affordable senior housing,” said Metro IAF member, the Rev. David Brawley. “It’s time for the mayor to stop talking about the problem and start doing something about it. Tenants have long feared NYCHA was secretly selling off housing, though officials have repeatedly denied any effort to eliminate apartments. another huge lot that’s used for football, basketball and family days. The last attempt to turn over NYCHA land to developers stirred resentment and ended in failure. Former Mayor Michael Bloomberg proposed raising millions by giving 99-year leases to developers to build towers on NYCHA developments in Manhattan. The towers were to be 80% market rate; 20% affordable. Tenants and elected officials railed against this plan, arguing that it amplified the income gap and ate up open space. On his arrival at City Hall, de Blasio killed that plan, but in the last few months, NYCHA has quietly begun moving forward with its own approach. This time NYCHA is cultivating tenant support, promising to sell land exclusively for affordable housing and spreading the projects across the boroughs. In the last few months officials have visited developments, searching for viable vacant land to sell to affordable housing developers. A small lot at the Linden Houses is among the properties for sale. Two weeks ago Olatoye met with tenants of the Millbrook Houses in the Bronx and revealed plans to turn over to an affordable housing developer a leafy triangle that now provides both shade and parking. Other tenants are worried that their playgrounds and green space will disappear and want NYCHA to fix up what’s there instead of turning land over to developers. At the Van Dyke Houses in Brownsville, Brooklyn, NYCHA last year sold off one parking lot to a developer for apartments for homeless families. Now they’re talking about selling off another huge lot that’s used for football, basketball and family days. A small lot at the Howard Houses is also among the properties for sale. Some tenants want very much for NYCHA to sell off land. At the Howard Houses in Brownsville, Rose Whetstone, 71, sees senior housing rising on vacant green space outside her window. She’s raised four children and two granddaughters there, and has been told by NYCHA she needs to move to a smaller apartment now that all but one granddaughter has moved out. Because NYCHA won’t commit to letting her stay in Howard, she hopes NYCHA will let a developer build senior housing on a big circle of raggedy grass hemmed in by rusting metal fence she says no one uses. How quickly this happens remains to be seen. Some of the for sale projects now in the works have lingered for years. At Prospect Plaza in Ocean Hill, Brooklyn, NYCHA recently demolished all 240 units in five buildings to be replaced by affordable housing — 14 years after evicting the tenants. And way back in 2003, NYCHA took ownership of an abandoned Far Rockaway shopping strip to create what it called a “town center site” across from the Ocean Bay Houses. 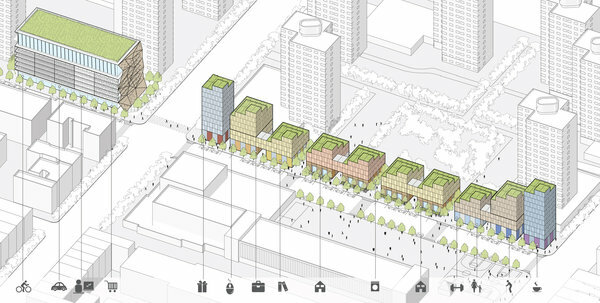 The project is scheduled for development through 2016 — 13 years after NYCHA first took the land. There may be no topic hotter than affordable housing in New York City right now, with it being the centerpiece of Mayor DeBlasio’s OneNYC strategic plan. But the battles that will be waged to create and preserve the 200,000 units of affordable housing promised in the next decade – debates over design, inclusivity, exclusivity, displacement, and more – are hardly new. This is precisely the story that a new exhibit at the Museum of City of New York aims to tell in Affordable New York: A Housing Legacy, curated by architectural historian and author Thomas Mellins. As a wider goal, it aims to situate New York City as a pioneering force behind the affordable housing movement, in its various manifestations since the 19th century. In fact, New York City was the first city to pass comprehensive tenement house laws in 1877. The sheer numbers of the affordable housing issue today are staggering: an estimated 1.2 million New Yorkers live in some type of subsidized affordable housing, equivalent to the number of people that live in the cities of Boston and Washington D.C. combined. That’s over 14% of the population of New York City. And New York City faces a particular challenge, due to a higher cost of living. As such, a larger percentage of residents qualify for affordable housing compared to that in other cities, and because the government includes families making up to 250% of the Average Median Income (AMI) in subsidies, this means a household income of up to $142,395 for four in New York City could qualify. Still, of course, 78% of affordable housing in the city is for those at low income and below. Lodgers in a Bayard Street tenement. Photo by Jacob A. Riis via Museum of the City of New York. Staircase inside the Vanderbilt Model Tenements, 1911. Photo by Wurts Brothers from Museum of the City of New York Collections. In 1926, the government becomes officially involved in affordable housing when New York Governor Al Smith signs a bill that creates tax and finance incentives to build housing for the poor, formalizing activity spurred by the private sector. This move brings in the labor unions, which build places like the Amalgamated Houses in the Bronx, and provide a model, both architectural and financial, for this new type of housing. The NYCHA exhibit at the 1939-40 World’s Fair, June 8, 1940. The Great Depression also further highlights the need for government intervention, and New York City receives a disproportionate amount of New Deal dollars. In 1934, the country’s first housing authority, New York City Housing Authority (NYCHA) is formed, whose vision incorporates both housing and social services. The exhibit also covers the various objections to public housing, which include its role in urban displacement, issues concerning racial segregation, and its believed affiliation with socialism and Communist ideals. Wagner Houses, East Harlem, Manhattan. Affordable New York: A Housing Legacy also showcases the other types of non-public, affordable housing initiatives like Mitchell-Lama, Title 1 (associated with slum clearance and urban renewal), and efforts of private companies like MetLife, which built Stuyvesant Town, originally a racially segregated development. Mellins points out that though NYCHA adopts a non-discriminatory racial policy in its founding in 1934, racial discrimination does not become illegal in private rental housing in New York until 1957. Aerial view of NYC with Stuyvesant Town superblock along the East River. As the exhibition moves into the 1960s, the role of labor unions increase in the Post WWII period. Architectural critique begins to seep into the narrative and younger architects like Richard Meier and Phillip Johnson are hired to make their mark on affordable housing design. Newspaper excerpts show the commentary of architectural critics like Ada Luise Huxtable and Paul Goldberger on housing, even Robert Venturi and Denise Scott Brown write a treatise entitled “Co-Op City. Learning to Like It,” a direct play on their seminal work, Learning from Las Vegas. Westbeth Center of the Arts. Image via Museum of the City of New York. Waterside Plaza, Kips Bay, Manhattan. Completed: 1973. Of the towers in the complex, those built after 1973 would become market rate. In 1973, President Nixon establishes a moratorium on public housing nationwide which limits large-scale new housing. As a result, NYCHA has built very few new buildings since this time period and government involvement has become focused on incentives. Beyond the photographs of visual decay and grit that so often resurface about the 1970s, Mellins wants to emphasize what the current, contrasting economic situation offers to New York. He says, “You walk down the street now and for better or for worse, there’s construction everywhere. There are 90-story buildings going up. You may hate them, but the reality is a lot of money is being invested in New York.” In the 1970s, there was massive disinvestment in New York, to a scale that is difficult to comprehend today. The exhibit ends with questions about the future of NYCHA properties and a showcase of new paradigms in affordable housing, including Via Verde, a skyscraper/townhouse combination in the Bronx with stepped terrace gardens. The building that has already contributed to the revitalization of the Melrose neighborhood and has encouraged the influx of new amenities. Indeed, just today, The Wall Street Journal proclaimed that Melrose is the “next dining destination” with the opening of two restaurants by James Beard-winning chef Douglas Rodriguez. Though these new paradigms do not yet include the upcoming co-living initiatives by startup darlings like WeWork and General Assembly, or the already open Crown Heights building Common, the initiatives in the current landscape, particularly by private players, showcase both the demand for affordable housing today and the entrepreneurial spirit that has characterized the legacy of the housing movement since its inception in New York during the 19th century.